One of the main principles of Trim Healthy Mama is to completely cut out sugar. This can be quite a hard task, but so beneficial for our bodies. I know when I consistently follow the Trim Healthy Mama plan, I feel so much better--a lot of that due to less inflammation because of better food choices and less sugar. THM has approved sweeteners--mostly stevia and a couple of other natural sweeteners. They even sell some of their versions in their online store. However, since you all know me as a pretty frugal girl, I just had to figure out a more economical way. I've been making my own for a couple of years! I originally bought a container of Truvia® at Walmart. 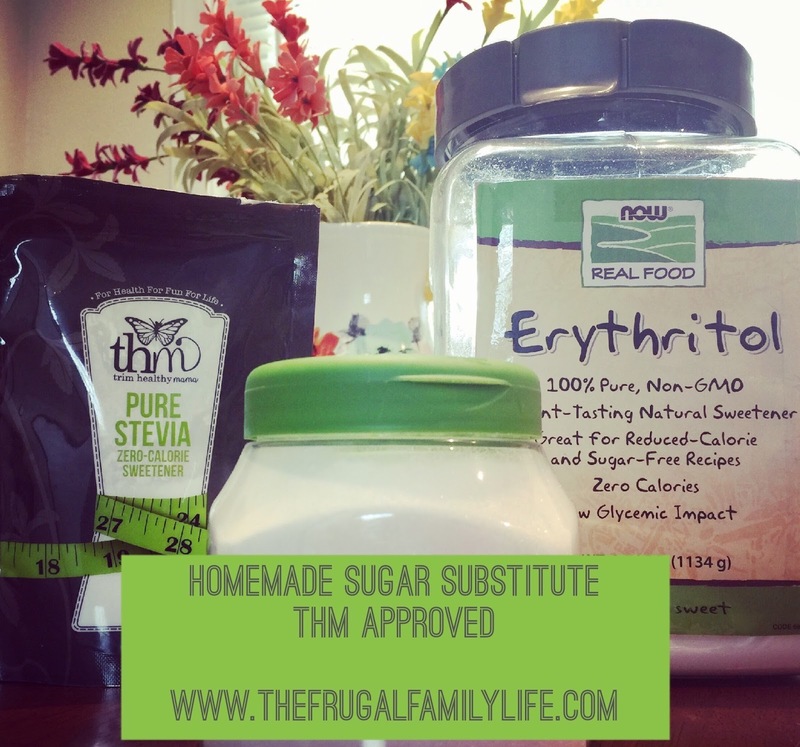 I liked it, it's stevia--so THM approved, and it worked to help with my sweet cravings. But, it's a rather small container and it can cost around $7. If you start any kind of actual baking you'll find you run out of it rather quickly. So, I decided it would be more frugal to make my own version of Truvia®. You'll need a container (I use my old Truvia® container), some Erythritol and PURE Stevia. The links are to the brands I use. Directions: Simply meaure the Erythritol and Stevia into your container. Close the container and shake it up to mix it well! You now have homemade Truvia®! You can find Now Brand Erythritol on Amazon or Jet.com for around $15 for 2.5lbs. Since you only use a cup at a time to make this recipe, it ends up lasting quite awhile. The PURE Stevia I use is the Trim Healthy Mama Brand. You can find it here for $10.99. Believe me when I say this bag lasts forever!! I just now--today--opened my 2nd bag of this and I've been doing THM off and on for about 4-5 years! You only use 1/2 tsp or less at a time because it is very potent! So, all in all, you can make your own homemade version of Truvia® multiple times for the price of only buying 2-3 containers of Truvia® at Walmart. **Also, if you are new to Jet.com you can save 15% on your first 3 orders! Just enter code WELCOME15 at checkout!